As soon as the first page is read, you can usually tell if you are going to like a book. I read the first page of How To Make Victoria Sponge: a journey of faith by Margaret Kazmierczak, and I knew that I was going to love the book. Victoria Sponge is a wife, daughter and mother to four children. She lives an ordinary life, and shares just one week in the book. The book is split into chapters, one for each day. Each day is split into morning, afternoon, evening and night. The novel is written in the first person from the perspective of Victoria Sponge. It is a very clever book, with each part of the narrative divided into present action, Victoria’s prayers and God’s words to her. These are all very clear as each is shown by a different print. The whole novel flows perfectly, and leaves the reader with a feeling of calm and great beauty. I could empathise with Victoria – her day could easily have been my day. Things happen – both good and bad. Life is hectic, but we have to make time for what is important. 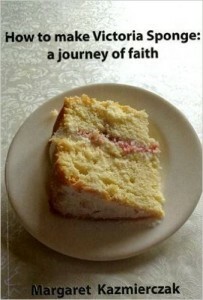 Every day Victoria Sponge says yes to God, and then she goes about her day. Her day is peppered with prayers, not the holier than though prayers, but the conversational prayers. She asks God for help, and she remembers to thank Him for all the good in her life. Victoria does daily life with God. Being a Christian does not make you immune to bad things, but when bad or difficult situations arise, Victoria looks to God for guidance. I absolutely loved the novel. It was clever. It was funny. It was ‘real’. it tugged at my heart strings and it made me cry. It is in essence, a very beautiful book. It will, if you let the words sink deep into your soul, change your life. I want to be more like Victoria Sponge, saying yes to God at the start of every day, and conversing with Him throughout the day, looking for opportunities to become more like God. I thought all of the characters within the novel were well drawn and likeable. Next to Victoria, my favourite was her teenage son Johnny, who had special needs. As a teaching assistant to teenagers with special needs, I found myself drawn to him. His words at times, broke my heart. As did the words spoken to Johnny by the school chaplain – you will have to read the book to see what I mean. The final fifty ages of the book are entitled The Jewel In The Sponge, and it is Johnny’s story for part of the week. It was wonderful to see the world through Johnny’s eyes, and to see the action from his perspective. I cannot urge you too strongly to buy a copy of How To Make Victoria Sponge. It is beautiful, with the power to change your life if you let it. I am definitely going to be buying more copies to give away to my friends. And I do hope that Margaret Kazmierczak will be writing many more books. Alison has a birthday coming up and this sounds like an excellent little extra. It’s a fabulous book, Mark. It stays with you long after you finish reading it. I bought several copies and gave them away. I bought one for Leon…but I guess it was probably damaged in the fire!